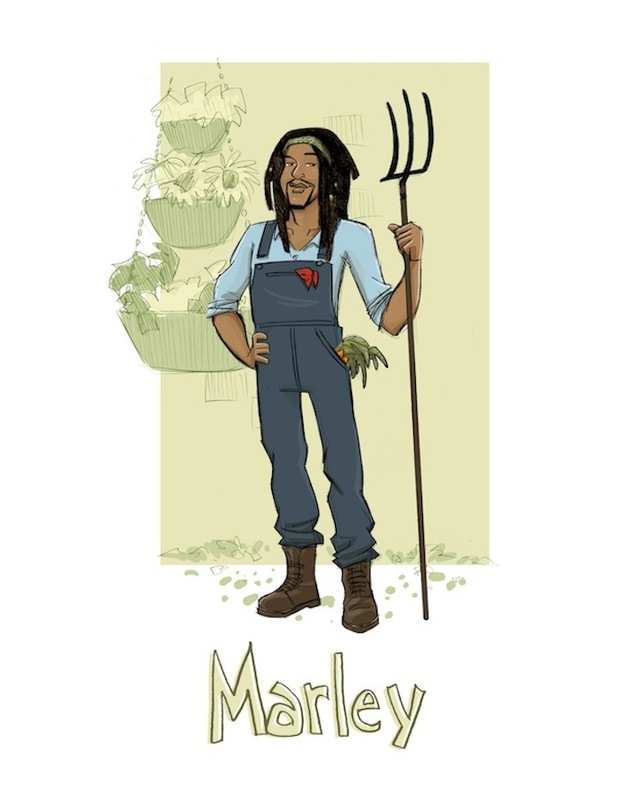 Meet Marley, he is the dedicated green lifestyle expert in Chef Egg's kitchen. Just like Chef Egg, Marley is a fan of all that mother earths seeds can provide. He often comes to Chef Egg's herb garden to rave about nature's bounty. He motions towards the sun as he presents a perfectly green pepper so vibrant, that praise must be paid. Marley knows that Chef Egg is the one that will finally serve the green truth to the world. The truth about gardening, recycling, and about treating everyone in our ecosystem with love and respect. Marley grew up in the mountains of Jamaica. At a young age he learned how to care for the family farm and cultivate the land to grow fresh produce for his community. He took his life experience and love for the land to University of California - Davis where he studied agriculture and environmental sciences. His goal was to study hard and share his knowledge with communities in need all around the world. Marley met Chef Egg at the Coachella Music Festival in 2007. While enjoying awesome music and a spicy vegetable curry, they talked about their love for food, healthy lifestyle and sharing this knowledge with young people. Marley joined Chef Egg's team as the green lifestyle guru; he loves to speak to the viewers about how they can grown and enjoy fresh produce while reducing waste in their communities. With great pleasure I would like to announce the creation of my very own line of hand soap. The "Chef Egg Bar" was created by yours truly and my friends at Biggs and Featherbelle. They are an all natural soap company out of Hampden in Baltimore Maryland and have created over 100 types soaps, balms and lotions that are all natural and free of artificial ingredients. 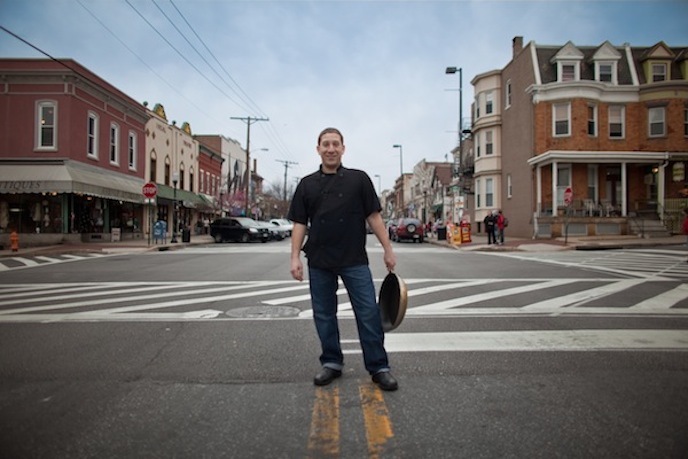 I wanted to sell a product that my students could take away from my cooking events that was functional and worthwhile. I figured chotchkies like bottle openers, aprons, chef hats and oven mits were neat but not unique to my mission. I wanted something that you could use everyday in your goal of culinary independence. That's when I came up with the idea for my own soap brand. With my background as a chef, I wanted to create a great soap for the professional chef and home cook alike. The inspiration came from a standard meat and veggie marinade of olive oil, kosher salt, fresh cracked pepper, lemon and rosemary. I really wanted something that would get stinky fish and raw meat smell off of my hands. The team at Biggs and Featherbelle went above and beyond my expectations. With my input, the ladies created a line of soap that would wash away grease and grime while moisturizing, exfoliating and leaving your hands with a fresh feeling. They incorporated kosher salt and fresh cracked pepper with lemon grass and rosemary essential oil to create the "Chef Egg Bar". The "Chef Egg Bar" will be available at my events as well as online (coming soon). If you want a bar today you can send $6 to pay pal account, cookingwithegg@aol.com and send your address to the same e mail. Menu: Sweet Potato, Spinach and Chickpea Curry with Naan and Chicken and Fig Tagine with Fall Spiced Basmati Rice. Menu: 5 Spiced Pork with Dried Fruit and Apple Compote and Apple Cabbage Slaw. 1. 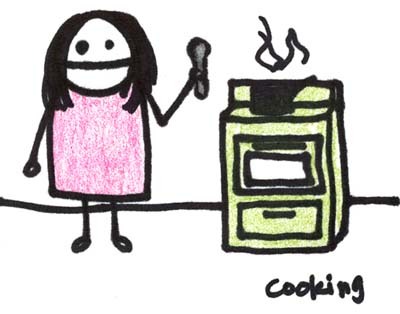 Cooking is fun and a great way to relieve stress after a hard day of work or school. 2. Learning to cook will help you to learn about world cultures and customs, and to obtain life skills like eating healthy, budgeting your money, and sanitation. This will make you a responsible and mature individual. You can surprise your parents; they'll never believe you. 3. It's Cheap! The bottom line is that cooking is less expensive. Eating at restaurants, fast food joints, and school cafeterias, and spending money on pre-packaged meals, gets to be very expensive for a young person on a budget - like me! 4. You have control over your menu and can pick exactly what you want to eat. 5. It is healthier for you. Staying away from fast food and convenience food - and instead, eating more fresh foods like fruits and vegetables, will increase your quality of health now and forever!